Though there are many ways to keep property and belongings safe, installing high security locks for your business in Dallas and Fort Worth, TX is your first line of defense. The assortment of high quality locks at affordable prices are available to you when you call Dallas FW Locksmith for all of your complete locksmith service needs. We at Dallas FW Locksmith are an established and respected locksmithing company that services Dallas and Fort Worth, TX and surrounding cities. Our services are performed by expert technicians, who are honest and trustworthy, and each have 5+ years experience dealing with all elements and types of high security locks. We are available for any situation at any time with the convenience of our reliable, 24x7 locksmith service. Give us a call to take advantage of our local 30 min response guarantee and our upfront pricing policy. We are licensed, bonded, and insured for your security and peace of mind. With the unbeatable, fast and friendly service of our mobile locksmiths there is not a lock that is out of our reach or abilities. Having the proper security systems and locking configurations is key to keeping a business or commercial property secure. We offer the best in quality locks and repair parts to our customers. Our high security locks are designed to provide the highest level of safety and security for your property and belongings. When you call on our commercial locksmiths to handle issues with high security locks in Dallas and Fort Worth, TX, our licensed, bonded, and insured technicians and mobile locksmiths will be standing by to install and repair your commercial security, Grade 1 locks. The high quality high security locks that we install are equipped with anti-pick pins, reinforced plates, and extra-long bolts and screws. All of these options can be discussed when our specialist visits your location to give you an honest and fair quote on the installation or repair work that is necessary. 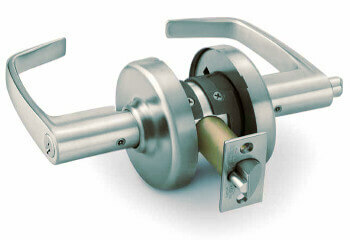 We offer a number of deadbolt systems that can be integrated into a commercial business setting. These include bolts of different sizes and security features. These security locks are designed to send a solid shaft of metal from the door lock into the receiving metal casing on the door frame. With an assortment of Grade 1 locksets to choose from, the consumer is able to select the system that is perfect for his/her needs. When you hire our complete locksmith service, our honest and trustworthy technicians with 5+ years of experience will offer their services at all hours of the day with our 24x7 locksmith service. Your business and property will never be in jeopardy with our locksmithing professionals on scene. Choosing a company to install and repair high security locks of a business requires a commercial locksmith service that offers the best expert technicians with a dependable 24x7 locksmith service at a reasonable and fair price. This fast and friendly service is always delivered with our upfront pricing guarantee and low, competitive prices. Our service and expertise are available to business owners in Dallas and Fort Worth, TX. When you call on us, we will guarantee fast and friendly service with a 30 min response. Call us or contact us via our online contact form to schedule your appointment and experience for yourself the fastest high quality locksmithing service and top-notch locksmith security services for the installation and repair of high security locks. The need for quality locksmiths in the Dallas-Fort Worth area has been cut short by the services offered by our company, Dallas FW Locksmith. We are available to handle all Grade 1 locks and security systems regardless of the time or day of the week. Our experts are highly skilled and knowledgeable of high security systems and will be happy to find the system that is perfect for your commercial establishment’s security needs. Dallas FW Locksmith – Grade 1 Lock Installation + Repair You Can Count On! High Security (Grade 1) Locks http://dallasfwlocksmith.com/high-security-locks/ 4.1/5 based upon 20 reviews.